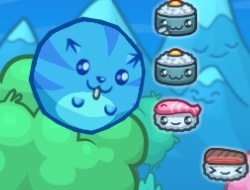 Join this Sushi adventure and have fun while you help this little fluffy ball to turn itself into an animal catapult that cross all over the land to collect and earn sushi points. Help out a cat in this skill game to reach her goals level by level and try to approach different ways to travel this magic food land. Use those bonuses you've got because they are going to help you during the game only if you know when is the most appropriate time to use them. Jump around to get more sushi, jump on the birds to propel yourself higher, also use those opportunity you've got to jump on the jelly things that could give you advantage when it comes to pass further. There is no need to panic if you don't succeed at first, you got to try until the mission you need you accomplish is done. Upgrade your features in the store and improve your skills by playing more and more. Sushi Catapult 10.00 between 0 and 10 based on 1 votes.